Print Servers tab incorrectly reports the status of the services that are running. eUpdate is unable to check the status of a service and update it properly. For security reasons, Windows will not report the status of a service if the user checking it does not have Administrative rights on that system. For example, if you are trying to check the status of a service named PrintServer2 you would need to be logged in as a user that is a full administrator of that machine. Log in as the user with full administrative rights to all of the servers or workstations you are attempting to detect the status of. a. To resolve the issue, upgrade the proper driver for that black and white device, or contact your Printer manufacturer for further support. In many cases, the Windows Firewall will also block being able to properly detect the status of a remote service. a. 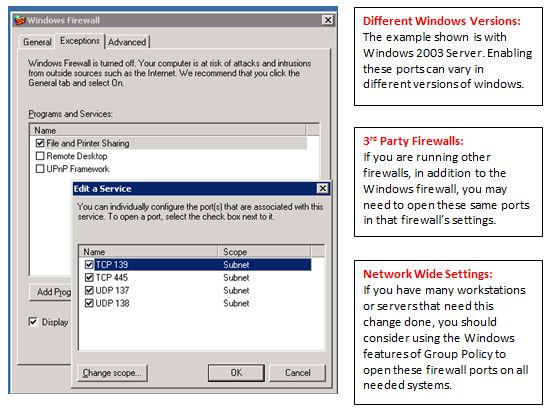 Open your Windows Firewall Settings within Control Panel. b. Locate the Exceptions tab, and find File Print Sharing. c. Check off the grouping of exepctions allowing this type of communication to the workstation. If the above did not resolve the issue, please send a support request via our ticket system Print Manager Ticketing System.